includes one-line box-drawing characters. Are there double-line box-drawing characters in terminal? For example how can I print the character "╢". What charset do you have your terminal set to use? If you are still using ASCII, you don't have double-line box-drawing characters available to you. If you are using UTF-8, you can send out the UTF-8 character sequence for these characters. I believe printf("╢") will work if you compiler accepts UTF-8 in the source code, e.g. gcc with -finput-charset=UTF-8. 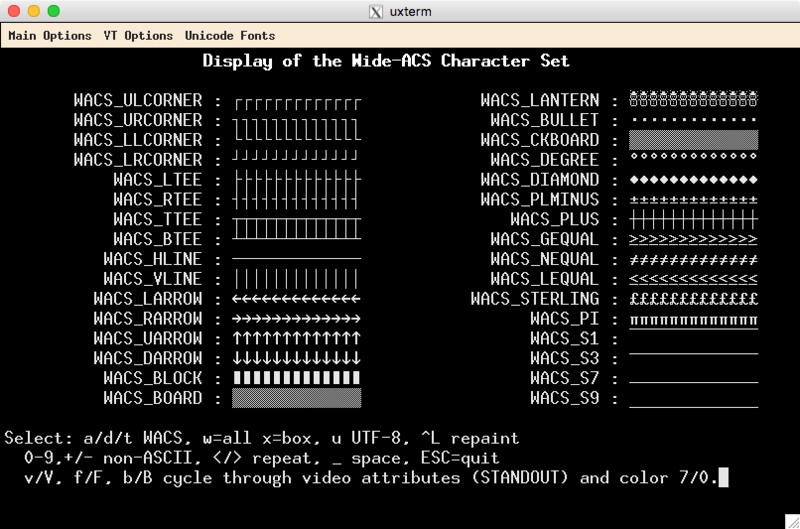 ncurses is useful for drawing text while moving about the screen (either full-screen, or a full-line using filter). OP's example prints a fragment of a single line, and the discussion gave no clues whether this was a typical use, or part of something more elaborate. How to erase unicode symbols in terminal? Can a script determine which characters a terminal can display?